There's a something about the Chesapeake Bay that captures the heart—a distinctive charm that has drawn families to its shores for generations. Many of those Bay families live full- or part-time in the countless small, private communities that trace the water's edge. Beverly Beach is one of those—a small neighborhood not far from Baltimore, Annapolis and Washington, D.C. Like many tight-knit communities, it's proud of its heritage and thoughtful about managing its legacy for future generations. So when the time came to replacing the weathered, out-of-date (and out of code) playground, the community came together (with more than 80 residents attending at one of the weeknight meetings) to discuss play preferences and priorities, and to form a clear vision of what the new Beverly Beach Community playground should be. They wanted the best of the old—classic playground features that never get old—with some new twists, turns and adventure. They also wanted a design and color palette that would harmonize with the beautiful Chesapeake Bay waterfront environment. 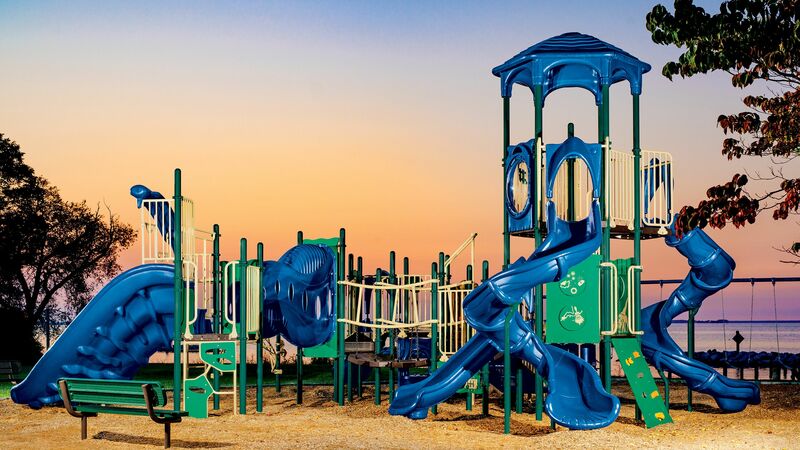 The resulting playground includes nods to the classics, like swings—every bit as simple and fun as the original, but safe, up-to-code and built to endure. Slides are here, too, but with exciting innovations that capture attention and lots of repeat customers. Two 360° Slither Slides swoop down from towering 9' lookout decks. The slide offerings continue with the irresistible Trippple Racer Slide™—fun for one, two or three friends plunging to the finish line. Other play features include “the funnel”—a tapered tunnel that requires walking and crawling to navigate—and the dynamic Adventure Bridge, which offers exciting (and safe) balance challenge, responding to movement as kids make the crossing. With its nautical blues and cascades of slides, the aquatic-inspired design pops against the scenic background. The new playground is now a favorite destination for Beverly Beach families. A point of connection (as well as pride) for the community, it's a beautiful beacon of play on the Bay.